With proper care your teeth and smile can last a lifetime. This means thorough daily brushing and flossing and regular dental cleanings and check-ups to avoid tooth decay and periodontal disease. Most people know that this can cause tooth loss if not treated, but for most adults it is periodontal (gum) disease that causes the most cases of tooth lost. If you have lost a tooth or teeth due to periodontal complication, dental implants are terrific solution to improve your oral health. Learn more about implants here. Periodontal disease is caused by infection of the gums and bone surrounding and supporting the teeth. Usually painless, periodontal infections can occur at any age and usually progress slowly, sometimes completely unnoticed by the patient. That is why check-ups are important to prevent tooth loss. The bacteria that causes periodontal disease is called “plaque”. It is a white, sticky film that forms on the teeth. This bacteria produces acid and other toxins that irritate the gums and bone and also cause cavities. If this plaque is allowed to remain on the teeth it will start to harden, which is called “tartar”. When soft and sticky it can be brushed away, but once it becomes hard it needs to be removed at a dental office. This is why periodontal cleanings, check-ups, and deeper teeth cleanings (called scaling and root planing) are so important if you want to keep your teeth. Also, when problems are caught early it reduces the expense of treating them. More advanced cases, or patients needing specialized care will be referred to a periodontist; dentists who specialize in periodontics alone. 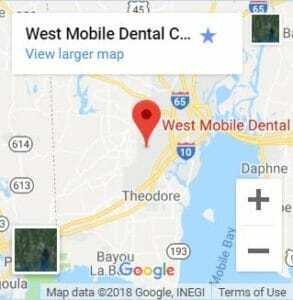 West Mobile Dental Care is conveniently located in Mobile, AL but proudly services Daphne, Prichard, Montrose, Fairhope, Tillman’s Corner and other neighboring communities. 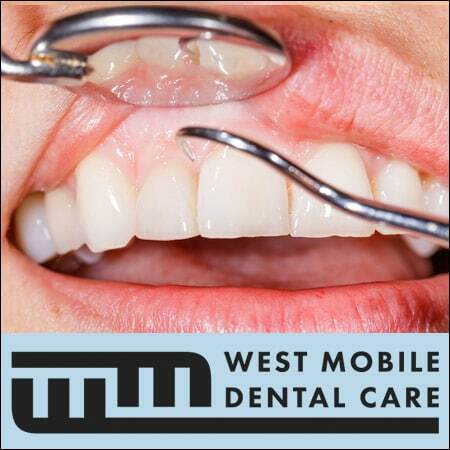 Schedule Gum Disease Treatment Today! Call (251) 666-3600. Puss between the teeth and and gums when pressed. Frequent bad breath or bad taste. Any change in your bite. Many times periodontal disease will not have any of the warning signs or symptoms. That’s why regular check-ups are important. Brush your teeth thoroughly twice a day, especially before bedtime. Use of a re-chargeable electric toothbrush such as Oral-B or Sonicare is recommended. These do a much better job of removing plaque that than a manual toothbrush. Carefully clean between the teeth with dental floss once a day. Dry mouth from medication, diabetes, smoking, gastric reflux, and other conditions can make you more susceptible to dental problems. Don’t hesitate discussing with your dentist if more aggressive measures might be appropriate in protecting your oral health. Medical research has recently shown a direct relationship between periodontal disease and coronary heart disease. It is believed that chronic periodontal disease releases bacteria into the blood stream which attaches to the walls of the coronary arteries leading to inflammation and eventual blockage.